For all your musical needs, come and shop at Reid's! All your musical needs... from Guitars to Drums... Pro Audio to Home Recording... Acoustic & Digital Pianos... Parts and Accessories!! Whatever you need we have it! If you don't find it here, contact us to see if we can get it!! We are able to ship Canada-Wide! 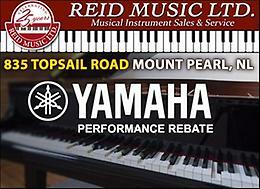 For all your musical needs, come and shop at Reid's! For sale Casio Keyboard with Sustaining Pedal. Keyboard is in excellent condition. Mason & Risch upright piano Beautiful refurbished upright full size 88 key piano. Recently professionally tuned and serviced, only reason for selling is it is not being used. Beautiful piano and sounds amazing, perfect for student pianist. Good condition asking $450 CASH ONLY !!!!!!!!!!! (77) Yamaha YPT-200 electronic keyboard in excellent working condition. Comes with factory stand and a/c adaptor & manuals. Reason for selling: not being used. For sale - electric organ amplifier w/ foot control volume peddle. Complete organ 'Spacesound System' w/ on/off switch. All made in Italy - circa 1970s. Also included, the complete wiring diagrams that came w/ the (now dismantled) organ. $40 for all. Organ (needs tuning,) $40, Text or Ph. 765-3174, emails do not work properly from this site. Hammond SK1 organ in mint condition. Stored since April 2017, not being used. Tuned December 2017. Small chip in wood from moving — does not effect the piano. No delivery. Pick up only. Serious inquiries only.